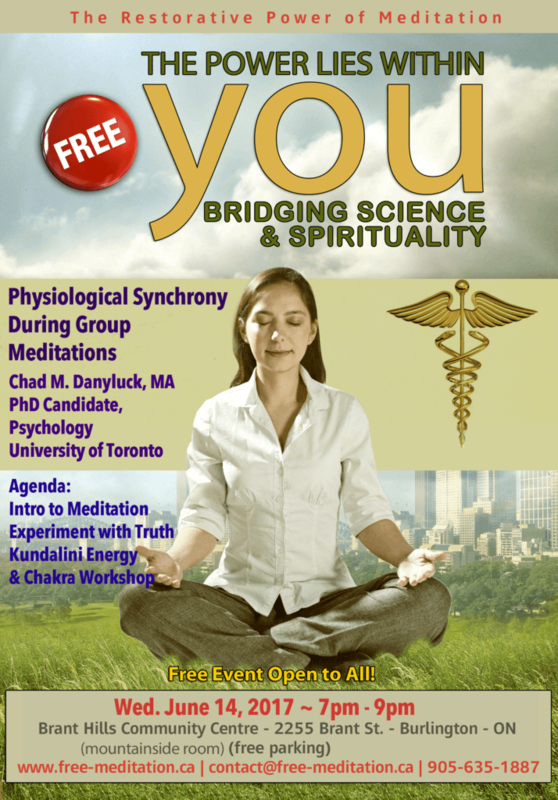 The Science and Experience of Meditation, Flute and Healing the Planet Feb. 17, 2018 in Oakville, Glen Abbey Community Centre-Always Free! This week I met so many marvelous people in the Halton region, (Ontario, Canada) putting up posters on bulletin boards, focusing more on Oakville to spread awareness of another wonderful free public event for Realize Awareness in Nations to Heal Mother Earth. People shook my hand, their eyes began to sparkle, they asked in depth questions, and some of them spontaneously got their self-realization (they achieved the yoga state, nirvana, moksha) in looking at the poster with wonder and while we talked. One employee from a coffee shop had many questions, which were very introspective. As I explained the yoga system that unlocks our central nervous system by awakening our own energy that enlightens our entire being, A.J. exclaimed he had goosebumps suddenly. So I told him, that is the life force, the energy we have been talking about, now you have felt it, and it is showing you what I am sharing with you resonates with truth. He said, I am totally going to the program, can I bring someone? Another lady from a pharmacy wearing a lovely elephant ring, was so glad, she stretched her arm out into the air and said, spread this, spread it everywhere! It was as if she was saying go forth! But all over Oakville, from Dundas, to Glen Abbey, to Lakeshore to Kerr Village, youths and adults alike, shook my hand, hugged me, marvelled at the wonderful animals on the poster, and were filled with a desire to experience this Yoga connection. About the poster, they said, this is so cool, I get it, this is what I have been looking for, I get it! One girl said, I was just manifesting something like this, and here it is in my store. Thank you so much, I am bringing my mom! It is a mini universe inside that connects us to the entire planet, living beings, the universe, and it can be felt like goosebumps, a cool river or breeze inside, or a wave. While explaining the poster and the system to a cashier, another lady looked over our shoulder and was asking, may I see the poster, can I come too? Can I bring someone? The energy was and is palpable once you get your self-realization, and they were responding with such genuine interest. It felt like that moment in the movie Tomorrow Land (with George Clooney) where the new generation picks up a curious badge that transports them to a new reality, you can really feel the vibrations coursing through your veins. A new awareness is infiltrating our society, and there are so many who have been searching for it. I did not know what to call it before, it is a type of inner journey, or truth seeking. And Sahaja Yoga meditation quenches a thirst for self knowledge. So come and experience the positive energy, feel the music of the flute flowing through your entire being, and find out the science and health benefits of meditation and experience it while sitting in a chair or on the floor, with no hard poses. Meditate to connect to Mother Earth, everything and everyone and feel it for yourself. We can heal the planet if we realize our powerful connection to it and all it’s living beings. May the force be with all of us!